Lebanese director/co-writer Nadine Labaki's Jury Prize-winning drama revolves around Zain (Zain Al Rafeea), a 12-year-old boy who decides to sue his parents for bringing him into the world. Born into urban squalor and a hard life on the streets of Beirut, Zain is already serving a five-year sentence, for stabbing the man who bought his 11-year-old sister's hand in marriage, and his case against his parents reveals grim details about a home life that is far more troublesome than originally thought. 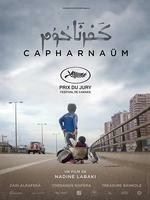 "CAPERNAUM, a sprawling tale wrenched from real life, goes beyond the conventions of documentary or realism into a mode of representation that doesn’t quite have a name. It’s a fairy tale and an opera, a potboiler and a news bulletin, a howl of protest and an anthem of resistance." "[Labaki] finds a magically resonant space between documentary-like vibe and dramatic performance that honors the characters’ inherent humanity while memorably framing the wretched circumstances that dictate their actions. ."
"For all of its brutal, raw force, Labaki’s excellent film is tough sledding — a sucker punch that lands with the emotional force of Dickens relocated to the slums of the modern-day Middle East. It leaves a bruise."